This weekend was the first step to qualify for the Loretta Lynn National. The NorthWest and MidWest area qualifier at MMX in Marysville. For the qualifier I raced in 3 classes…. My Dad worked on my bike and got it handling the way I wanted it so I felt comfortable on the track. They had so many entries that many of the classes had to run heat races and last chance qualifiers to see who would be able to race in the main event. The track got really rough and slick and I was very happy to keep my bike on two wheels and be able to battle with some really great riders and finish the weekend qualified in all three of my classes. In my 85 9-12 class we had 35 racers and I was able to finish with an overall 2nd place finish. In my Mini Sr 1 Class and my Mini Sr 2 Class I was able to finish with 2 overall 5th place finishes. My buddy Gary was announcing the races all weekend and I was able to go up in the announcers tower to talk with him and show some love to all of my sponsors. AND……. WHO WANTS TO GO SHOPPING? I just got my bLUcRU debit card in the mail! Last week it rained a lot, but the weather was clear for the weekend. Saturday’s practice was kind of a mess, but Sunday got better. Oatfield had practice on Saturday and we went to do some riding. When we got to Turlock it didn’t look good…… We couldn’t see the track because the fog was everywhere. It took several hours for the sun to come out and we could see the track. Once the track was clear we saw that they had cut off a few sections of the track because of the mud from the rain and other sections of the track was really thick. I had to wait until they let the kids on the track and then I was ready to go. The track was not very good, but it was good practice and I rode well. Everyone at the track was not happy with the conditions, and most of the kids left early. We finished our practice and headed home to wash all the mud off the bikes. 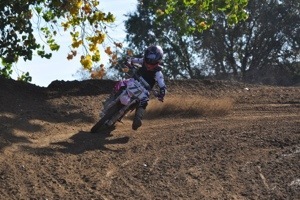 On Sunday I went riding at MMX, I was able to ride the main track and the sand track all day. I got there first thing in the morning and I was able to ride a couple of hours with the big bikes and we had a lot of fun battling. During my brakes I passed out some 51 Fifty Energy Drinks and flyers from 51 Fifty and Moto Efx Graphics. All of the guys loved the drink and they were ready to keep riding. It was really cool that the Lawrence family came all the way to Marysville to watch me ride. The whole family and the Moto Efx Team are amazing and the really care about the sport and the riders. Thank you guys for coming out in the cold, you guys rock! A couple more pictures of my day of riding. Moto Efx for graphics at www.motoefx.com ….. contact them now to get the Christmas discount. LIVING THE MADNESS…ON THE RACE TRACK! This last weekend I decided to do some practice on my wrist, body and bikes! Saturday morning we got up early and drove to Marysville to ride at E-Street MX. I planned on meeting a lot of my friends their and we raced together with the other riders all day. I rode for five hours and then it was time for lunch. 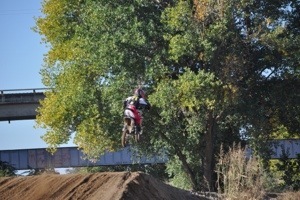 My parents and I went to get something to eat and then we went to the night practice at Riverfront MX. My friends couldn’t go with us, but I had sooo much fun because I got to ride with the big bikes. The big bikes kept getting on behind me and we would battle and have little mini races, I even got to bump bars with some of them. It was fun riding under the lights and racing with big riders. By the end of the night I was very tired and ready for bed. I woke up Sunday morning and it was time to do some more riding. 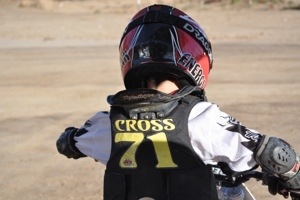 We went to MMX and I rode half the day on the sand track and half the day on the main track. I rode my bike from one end of the property to the other. I liked riding several different tracks at the same time and having to change my riding style from track to track. I am glad I took 51 FIFTY ENERGY DRINKS and so were the other riders…..
After a weekend full of riding, I got about 7 new blisters and only one scratch on my arm…..I think it was an amazing weekend. Last Sunday morning my family woke up early and we left for Marysville to race the second round of the CMC series at MMX. The other riders spent the day on Saturday practicing and learning the fast lines around the track for Sunday’s race, but I was not there Saturday. I had not been to MMX in over a year and the last time I was at the track it was totally different. When we got to the track I was supposed to get 4 laps on my 85 and 4 laps on my 65 to learn the track and figure out how to be competitive before the race started. During my 85 practice my bike would not run and I was not able to practice at all. I did get the 4 laps on my 65 and then it was time to start racing. 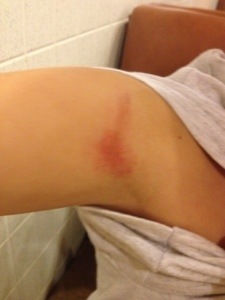 My first race was 65 Intermediate……I got the hole shot and then was passed on the first lap. While following behind the rider that past me, I was able to find more speed and was able to chase him back down and was looking to try to make a pass on the last lap when I slid out going over a jump and crashed. I was able to get up and going again and finished the race in 3rd place. In the second 65 Intermediate race…..I got another hole shot and was able to stay in the lead all the way to the end for a 1st place finish. I ended the day with a 2nd place overall. 65 Open was my second race…..I finished in a close second place and again by the time the second round came around I was getting more comfortable on the track. I finished the second 65 open race in 1st place and finished up the day with a 1st place overall finish. 85 Novice was a little more difficult……. My Dad changed the spark plug on my bike and it was running better. I went out for my first race and about two laps in the bike had no power and would cut in and out. I tried my best to finish the race, but only pulled out a 6th place finish. My Dad worked on the carburetor and the gas tank and again thought we had the problem fixed for the second race. Again I started out really good and then a couple laps in my bike stopped working again. I finished the second race in 5th place and finished the day with a 5th overall. Not bad for a half working bike! It was hard to try to pick up on the track and other riders and ride well, but it was really fun to show up and race without seeing the track. Check back because I am going to add pictures later….. This week was about different kinds of dirt and sand. 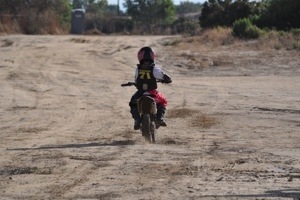 I practiced at four different tracks, two dirt tracks and two sand tracks. One dirt track was hard packed with huge rutts and the other had loose dirt with rolling rutts. The two sand tracks were also different, one track had sand sections and the other track was mostly all sand. It was really fun riding all four days and such different surfaces. Saturday was over 100 degrees and a lot of the riders went home early after a few rounds of practice. It was awesome because for the last few hours of the day I had the whole track to myself. On Sunday we got to the other track early and I was able to be the first bike on the track and make my own lines. I rode for 30 minutes before other bikes showed up and it was really cool to have the whole track to myself before it got crowded. It was a really eventful week, and weekend. Two of the tracks are close to a lake and my friends and I went to cool off after riding all day. 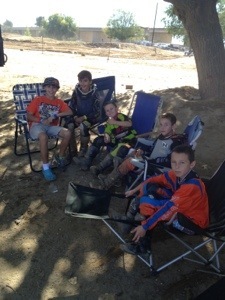 We went to MMX this weekend because they had a race there on Sunday. I practiced on Saturday and had a really great time riding with all my friends. 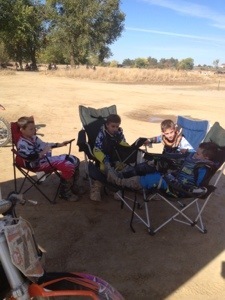 I was able to practice my 65cc bike with the 85cc kids and my 50cc bike with the 65cc kids. I had some great battles and the track was great! My Grandma and Grandpa came to watch me ride and I made them nervous. My sisters were there watching and we got to go on rides in the Polaris. On Sunday they didn’t have any kids signed in to race so instead of racing I went to E-Street to practice. They didn’t have many riders there, but I got a lot of riding time on the track and had a lot of fun.